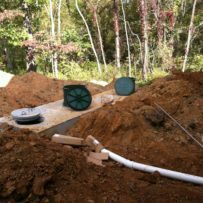 New Home Septic Tank Installation in Fauquier County, VA. Our AOSE certified professionals provide a turn-key operation for your wastewater system needs. Comprehensive services include an on-site estimate and survey, soil test, design, and final system review. Our industry knowledge will assist you throughout the entirety of the planning process and we submit all licensing requests to the Virginia Department of Health & County Planning & Zone. Photo features a Septic Tank Rise, Sewer Line, and Pump Tank.